A Companion to World War I. The First World War, as its various names suggest, was a conflict of enormous scale and scope, a Great War and a global one. 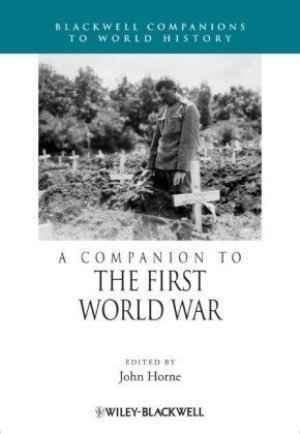 Doing justice to the diversity of events and experiences in printed form is difficult and involves a great deal of expertise and words, as shown by the scale of Hew Strachan’s ongoing ‚First World War‘ trilogy, the first volume of which runs to 1227 pages. With the volume on the war for their ‚Companions to World History‘ series, Blackwell have gathered together a great deal of expertise and quality writing under stewardship of eminent Great War historian John Horne. The resulting work provides an excellent balance of the history, experiences and legacy of the war, balancing the Western Front with other theatres, and including both preconceptions and after-effects of the conflict. Horne rightly describes the war of 1914-18 as the epicentre of a wider period of violence stretching from the Balkans Wars of 1912-13 through to the Russian Civil War ending in 1923 (p. xxv), a broader period the chapters here help to elaborate where relevant. Four substantive sections on ‚Origins‘, the military campaigns, the ‚faces of war‘, the ‚states, nations, and empires‘ involved and the war’s ‚legacies‘ are accompanied by an impressive extended bibliography and guide to selected primary sources published in English. The roll-call of historians involved is impressive, including many who have produced well-received monograph general or national histories of the war or works on the aspects of the conflict that they present here. My only criticisms are over slight shortcomings in the otherwise successful global reach of the project: first, in the attention to neutral nations and, second, some occasional lapses into Western-Front-centrism. Asking for more chapters in a book already containing 38 chapters seems slightly churlish, but given the recent increase in scholarly attention towards neutral states, more on these would have been welcome. European neutrals are mentioned in terms of their sympathies and the entry of many into the war, as well as the roles of Woodrow Wilson and Pope Benedict XV in attempts to organise a negotiated peace (pp. 206-11). An expanded discussion of the nature of neutrality in a ‚total‘ or global war and the experiences and impacts of the war in neutral European states such as Spain, Sweden, Norway, and the Netherlands would have added another ‚face‘ of the war, as would more attention to neutral South America. That some of the chapters on cultural aspects of the war tend to be centred on France, Britain and Germany is understandable given the immense cultural legacy of the war in those countries (as compared with those where revolutions and collapsing empires provided other foci for attention in the early twentieth century, such as Turkey or Russia). Occasionally, though, there are less explicable lapses from the broad scope of the volume, notably in the chapter on ‚Combat‘, which primarily describes a „Western tradition of combat“ (p. 181, and in various forms elsewhere in Ch. 12) changing in terms of the technologies, tactics, conditions and impacts of combat. The account itself is a good study of the Western Front, but lacks in-depth attention to combat on other fronts where, as we are told in another chapter, „the standard pattern was de-modernization“, whereby modern weapons and over-taxed infrastructure met and „war-making regressed to early nineteenth-century paradigms“ (p. 66). Such narrow accounts are few but frustrating given the volume’s efforts to give attention to under-exposed aspects and areas of the conflict, such as the war in Africa and the experiences of the French and British Empires. While all of the authors are established authorities on their subjects, the association of a quarter of them with the Historial de la Grande Guerre at Peronne might cause alarm among those who disagree with the ‚war culture‘ and ‚consent‘ thesis of war mentalities associated with that institution and elaborated most forcibly by the directors of its Research Centre, Stéphane Audoin-Rouzeau and Annette Becker (both contributors here). ‚Cultures of war‘ are referred in several chapters in this volume, and indeed in one chapter-heading (Ch. 16). The ‚consent‘ or ‚war culture‘ approach has, then, had an impact on some of the writing, particularly on the cultural aspects, but this does not make the book a dogmatic treatise on ‚consent‘. Indeed, the transnational approach of the Historial gives itself easily and effectively to projects like this, part of the strength of both being the range of nations and languages represented and studied by the historians involved. On an academic level, one or two more references to ongoing debates on salient features of the war would also have been welcome. These need only be footnotes so as not to break up the flow of the very readable chapters, which are intended for students, scholars and general readers (pp. xxv-vi). Hew Strachan provides a good examples of this type of reference regarding his disagreement with another writer over whether the German assault on Verdun in 1916 was intended beforehand to be attritional (pp. 46-7); Holger Herwig does not mention this debate, while references to the Schlieffen Plan pass without comments on the ongoing debate over its status. In its scope, its detail and the quality of scholarship and writing, this book certainly fulfils the aims of the Blackwell Companions in presenting up-to-date research in a way that is accessible for both those studying the subject and those with a general interest. It will provide both with a useful resource, but is perhaps most effective as a resource used by students on courses dealing with the war or modern conflicts more broadly, providing potted histories of important aspects of the Great War across the globe. The attention given to fronts other than France and Flanders, and nations other than those that fought there, is both laudable and effective, a useful corrective the Euro-centrism that often affects English-language works on the Great War. Hew Strachan, First World War. To Arms, Oxford 2001, part of a planned three-book series. See table of contents for the full list of authors. A panel on neutral countries at the 2009 conference of the International Society for First World War Studies showed the growth of this area of research. See my conference report: <http://www.firstworldwarstudies.org/?page_id=491> (18.10.2010). Stéphane Audoin-Rouzeau / Annette Becker, 14-18. Understanding the Great War, New York, 2003. The opposing (‚coercion‘) camp rarely publishes in English, which perhaps explains the influence of the Peronne school on English-language research. See Leonard V. Smith, The ‚Culture de guerre‘ and French Historiography of the Great War of 1914–1918, in: History Compass, Vol. 5, No. 6 (2007), pp. 167-179, and Pierre Pursiegle, A very French debate. The 1914-18 „war culture“, in: Journal of War and Culture Studies, Vol. 1, No. 1 (2008), pp. 9-14. The debate has its origins in Terence Zuber’s article ‚The Schlieffen Plan Reconsidered‘, in: War in History, Vol. 6 (1999), pp. 262-305. See the numerous articles on the subject in the same journal since 1999. Stuart Hallifax: Rezension zu: Horne, John (Hrsg. ): A Companion to World War I. Oxford 2010 , in: H-Soz-Kult, 08.11.2010, <www.hsozkult.de/publicationreview/id/rezbuecher-14414>.